Researchers have demonstrated novel parasite behaviour which offers a potential new target for malaria diagnosis and intervention. Malaria, a blood borne disease caused by single cell parasites, remains a major global public health issue with millions of cases, and nearly half a million deaths every year. The new discovery in the parasite's biology is revealed across a set of three studies led by the University of Glasgow's Wellcome Centre for Molecular Parasitology. The studies are published in Nature Communications, Science Advances and MBio. 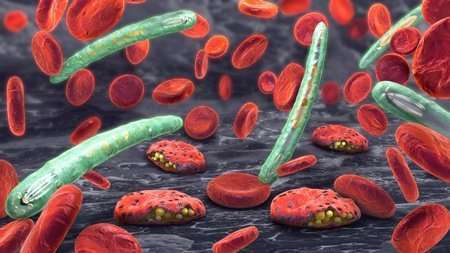 The researchers have discovered that malaria parasites can occupy sites outside the bloodstream, specifically in the bone marrow and spleen where red blood cells are formed. The studies show in animal models and human infection that this is the major niche for the development of malaria transmission stages and a significant reservoir for the parasite's replicative stages. The researchers demonstrate, for the first time, the movement of blood stage parasite forms and their migration across the vascular barrier to other parts of the body. Further, the work demonstrates that localization in the bone marrow and spleen allows the parasite not only to build a 'reservoir of infection', but also to gain additional protection from certain antimalarial drugs including the current frontline drug artemisinin. The findings from these new studies show why malaria parasites invading the bone marrow and spleen, where red blood cells are formed, could be crucial to targeting the disease. Professor Andy Waters, Director of the Wellcome Centre for Molecular Parasitology, said: "These papers together represent a step forward in our understanding of the behaviour of the malaria parasite. It is possible that bone marrow serves as the reservoir of infection avoiding the immune system and preferentially producing and releasing gametocytes so that when mosquitoes appear the disease can be retransmitted." Professor James Brewer, Chair in Basic Immunology at the Institute of Infection, Immunity and Inflammation, added: "These findings will also allow us to potentially find new drug targets for the disease, redefine what drugs have to achieve in terms of parasite killing and find new ways to fight back against the malaria parasite." Malaria is a blood borne disease caused by single cell parasites that invade, grow and then replicate in red blood cells, which then burst releasing new parasites that initiate a new blood stage cycle of invasion – a process which makes malaria such a deadly disease. Malaria is transmitted by female mosquitoes which themselves become infected when they take up parasites from an infected person as they take their blood meal. However, this human to mosquito transmission is only achieved if a small subset of blood borne parasites have escaped the cycle described above and instead have developed into a specialised form (a gametocyte) for transmission. Matthias Marti, Professor of Parasitology, said: "Malaria has a complex lifecycle which involves stages within the Anopheles mosquito, and within the human host, and past research to develop effective therapeutics targeting transmission has specifically focused on the mosquito stage. "In close collaboration with the lab of Prof. Volker Heussler (University of Berne, Switzerland) we have unravelled novel biological features of the parasite in its natural bone marrow and spleen environment, and we anticipate that these exciting findings will open up a new area of research. At the same time, we will evaluate the potential of our study for a new target for malaria diagnosis and intervention." 'A cryptic cycle in haematopoietic niches promotes initiation of malaria transmission and evasion of chemotherapy' is published in Nature Communications; 'Bone marrow is a major parasite reservoir in Plasmodium vivax infection' is published in mBio; and 'Plasmodium gametocytes display homing and vascular transmigration in the host bone marrow' is published in Science. Two of the three studies were performed in an international collaborative effort including groups led by Prof. Volker Heussler (University of Berne, Switzerland), Prof. Terrie Taylor (College of Medicine, Blantyre, Malawi), Profs. Dyann Wirth, Manoj Duraisingh and Curtis Huttenhower (Harvard University, Boston, USA), Prof. Tom Wellems (National Institute of Health, Bethesda, USA) and Dr. Nicanor Obaldia (Gorgas Institute, Panama).